Sometime between Friday 31st January and Sunday 2nd February, the Wincanton Community Church was broken into. Police are appealing for anyone in the area during that period with information to come forward to help solve this callous crime. Welcome to Wincanton Community Church. We are a Pentecostal church in association with the Assemblies of God. 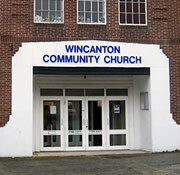 The church has existed in Wincanton for around twenty years. From Cinema to Sanctuary. An account of the Church and its worship that operates from Wincanton's former cinema.